Nitrogen (N2) is AIR, more specifically, AIR is between 79% and 80% Nitrogen and is what we all breathe everyday. The remaining components in our breathable air is combined mostly of oxygen and CO2. Nitrogen is colorless, tasteless and (obviously) non toxic. Carbon dioxide is a greenhouse gas which makes up about 0.038% of the Earth's atmosphere. CO2 has been, and continuse to be created (abundantly so) by the burning of fossil fuels. Combined with its long residence time in the atmosphere, this has made carbon dioxide the leading cause of man-made global warming. As a nitrogen molecule is about 3% larger than an oxygen molecule, it does not escape through the tire wall as easily as oxygen can and therefore leaks at a much slower rate than oxygen. A car tire filled with Nitrogen is estimated to maintain the same pressure approximately three to four times longer than oxygen-filled tires. Proper inflation provides better fuel economy, tire specific handling properties, increased tire life and increased safety for your family. All of this being based on the tires maintaining the proper air pressure over a more consistent period of time. An Oxygen filled tire provides unwanted oxidation which serves to breakdown the rubber in tires, and corrodes (steel) wheels. Nitrogen is a harmless gas which does not react negatively with rubber tires and steel wheels, nitrogen filled tires reduces tire heat, therefore decreasing rolling resistance and or friction, and increasing fuel economy. A large number of mass transportation companies around the world fill truck tires with Nitrogen for added safety. Should a vehicle catch fire, ruptured oxygen filled tires fuel the fire. N2 filled tires do not add fuel to the fire should they leak or rupture. Increased Mpg / Fuel Savings! Maintains Proper Inflation 3 to 4 Times Longer! 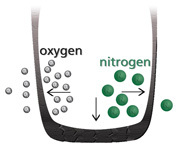 Does using nitrogen vs air in car tires make any difference? As consumers, it is doubtful that at $6.00 (or more) per tire when just periodic checking of pressure is sufficient, that any money would ever be saved. Should we happen to have two quarters available when we think about it to check and fill our tires, our tires would likely stay at a more constant pressure. This whole controversy merely serves to show how organizations can and will, exploit a partial truth and through a little marketing can produce a new perceived need (and expense)for the consumer.